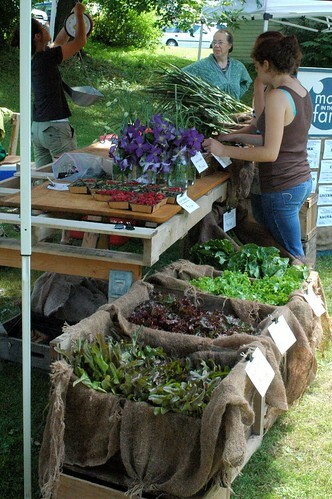 We did it - we pulled off a wonderful Farmer's Market on Saturday in Millerton. We had nine growers (ten next week, but Heron's Roost Farm didn't bring their pies because their gooseberries weren't ready!) and a steady flow of happy customers. It was festive, the weather was perfect, and boy were we exhausted at the end of the day! Five high school students are working as interns, staffing stands for some of the farmers who can't get away (or, in the case of the folks at Camp Isabella Freedman, can't work on Saturdays) and doing all the hard work moving tables and setting up tents. They had such a good attitude and I think are really enjoying it. Now we just have to do it all again next week, and the week after.... See all my other market pictures here. I am happy for your Jenny. You guys pulled it off and you got some nice photos. You are the second Farmers Market I have seen ..both very nice..the other was at http://madisondailyphoto.blogspot.com on the 8th!